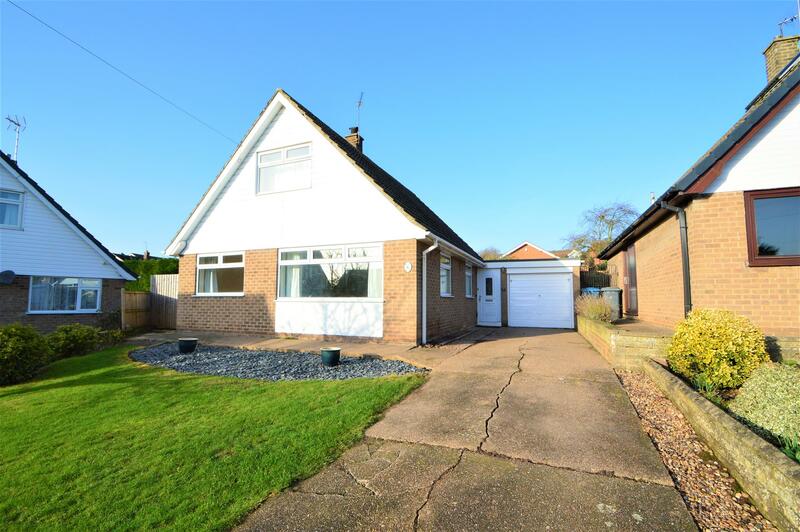 Benjamins are proud to bring to the market this 3 bedroom detached house on Chichester Drive in Cotgrave. The property is located on a rather generous sized plot with mature front and rear gardens as well as off road parking for several vehicles which leads to a single garage. The internal accommodation benefits from UPVC double glazed windows and briefly comprises of entrance hall, fitted kitchen, living room, bathroom, hallway and third bedroom/study to the ground floor. 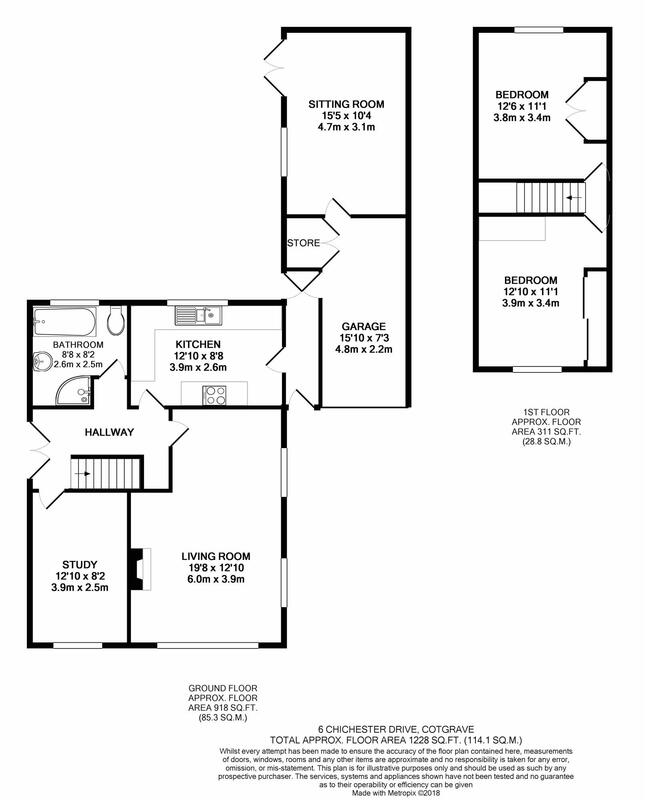 The first floor contains two double bedrooms both of which have fitted wardrobes. Doors leading to the kitchen, rear garden and the garage. After walking through the kitchen from the entrance hallway you come to the main hallway which has doors leading to the living room, bathroom, bedroom three/study as well as patio doors leading out the rear garden, stairs leading to the first floor. Beautifully re decorated with double glazed windows to both the front and side elevation, class one open fireplace, two radiators, two light fittings, carpet. Window to the rear elevation, roll top work surfaces, wall and base storage units, electric cooker, cookerhood with extractor fan, integrated dishwasher, fridge freezer and double oven, one and a half bowl sink with mixer tap over. Double glazed window to the front elevation, radiator, pendant light fitting, hardwood floor and a range of fitted bedroom furniture including wardrobes and two sets of a chest of drawers. Double glazed window to the rear elevation, fitted wardrobes, radiator, pendant light fitting, hardwood floor. Currently used as an office but could become a third bedroom for downstairs living, double glazed window to the front elevation, radiator, laminate flooring. Tastefully refurbished four piece bathroom suite including bathtub with mixer tap over, shower cubicle with shower head over, wash hand basin with mixer tap over and under cupboard storage, low flush W/C, two obscure windows to the rear elevation, spotlights, heated towel rail, full tiling to all the walls. Window to the side elevation, electric fire, patio doors leading out onto the rear garden, radiator, hardwood flooring, seven wall mounted light fittings. The property is set back from the road in the corner of the cul-de-sac with a front garden mostly laid to lawn with some slated borders. The property has off road parking for several cars which leads to the single garage and front entrance. There is side access from the front of the property to the rear of the property. The rear of the property boasts a large enclosed rear garden which is partly laid to lawn with large planted borders and paved areas including a patio area off the sitting room.